We guarantee the installation, operation and maintenance of our dosing systems in any area of business, for all our customers, through our Technical Assistance PGS, composed of 12 technicians equipped with mobiles workshops which have all the tools and spare parts to ensure immediate and professional assistance throughout the national territory, Portugal and France. We offer to our customers and distributors, our experience and knowledge to advise on normative, legislation, logistics, certification and any aspect related to the daily operation of our organizations. The PRODER maxim is that the skills, attitudes and knowledge of each member of the company are its greatest asset. Our obligation is to promote, develop and expand all the knowledge and attitudes of the members of our organizations, transmitting our experiences and knowledge to the market to dignify and professionalize our job. PRODER CONSULTING offers the experience of 25 years of work by more than 100 professionals to provide the best training in the industry. PRODER guarantee to all customers and especially those with multiple delivery points scattered across the territory, an effective logistics service that guarantees delivery of all our products, within minimum time. This is possible thanks to our affiliated companies and a network of PARTNERS joining our global logistics service. The Company management declares mandatory the application of quality systems and environmental protection in all areas of our business. 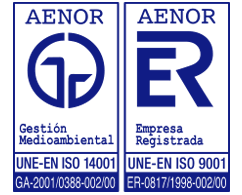 Our commitment to quality and the environment is not limited to obtaining the certifications UNE-EN ISO 9001 and UNE-EN ISO 14001, but maintains a constant challenge to improve in order to obtain the total satisfaction of our customers. Management considers the quality of its services and environmental protection as one of the essential pre-conditions for the success of its business.This value must be assumed by all PRODER’s members and employees, who are aware of their involvement and accept the responsibility to contribute to the achievement of quality and the improvement of environmental performance in all areas ‘company’s activity.